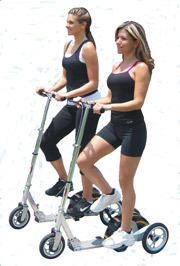 The Pumgo Scooter is a new way to exercise that combines the benefits of bicycle and stair-climber workouts. Pumgo riding is an efficient, low-impact cardiovascular activity that burns the equivalent calories as cycling, rowing and power walking in an enjoyable riding experience. The reciprocal recovery pedals and dual drive-train system establish the Pumgo Scooter as a true innovation in human powered vehicles. After sitting all day in the office or at school, step out on the Pumgo Scooter to stretch and strengthen back and core muscles. Instead of leaning forward as on a bicycle, stand up straight and relieve the pressure on your back while achieving an efficient workout. Relive your youth and have fun outdoors. A cool gadget for the whole family!